I just spent an hour digging a car out of 1.5 feet of snow, so it's a relief to come back upstairs and post photos from my sun-drenched vacation! A five day cruise sponsored by one of our GCM network churches—it was the first I'd ever been on. 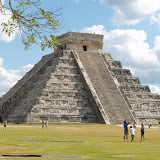 Days at sea were a blast, but from the first port (Progreso, Mexico ) I got to visit on of the seven new wonders of the world—the incredible Mayan ruins of ChiChen Itza. My only regret: we only were able to spend two hours, meaning I still missed significant portions of the national park. 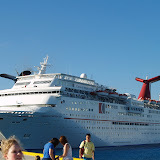 Our second port at Cozumel, an island very near Cancun, was a day relaxing on the beach... I got a sweet tan. I would definitely enjoy doing this again!